I had a meeting at MnDOT’s Metro Division at “Water’s Edge” in Roseville. 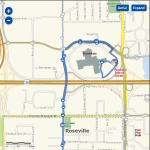 This is a short distance (though by no means non-circuitous distance) from the Rosedale Transit Center. 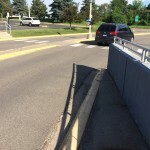 To maximize irony (showing up at a suburban MnDOT office building by transit) and since it was a nice day, and because I have a 1 car household to begin with, and since I was not time strapped as this is summer, I took transit to get there. The new 67 bus (not a new bus, a new bus route) picked me up a short distance from my home on-time, and took me to a transfer point at Minnehaha Avenue and Snelling Avenue in St. Paul where I transferred to the 84 heading northbound. I exited at the exit ramp from Snelling to County Road B2 and walked to the building. I attended my meeting, and walked over to Rosedale to catch the return bus (and eat lunch). This is a spiral shaped bus route. The 87 exiting Rosedale Center. This sidewalk at Water’s Edge assumes you lose a lot of weight while walking, and get really skinny. This sidewalk assumes you don’t actually want to enter the building. This sidewalk along County Road B-2 is forlorn, but adequate. On the return I took the 87 from Rosedale Transit Center to University Avenue and transferred there. Load Factor: Some of the buses were practically a personally limo. Though the first bus was at 8:30 in the morning, there was only 1 other passenger on-board. Because there were so few passengers, there were no delays. (Well there was a bit of a minor delay due to emergency vehicles attending to an emergency at the Days Inn on University (the eerily pre-named Tracks), but (a) it was less than 30 seconds, and (b) this seems unusual. We were so far ahead of schedule when I alighted the bus put on its flashers and waited at least one traffic light cycle to not get ahead of itself. The 84 had a modest number of folks northbound. On the 87 southbound there was also one other person for most of the trip. The 16 was not crowded. I realize this is off-peak direction in the off-peak time of day in the off-season, but maybe think about smaller buses? Ride Quality: The bus was designed with the bus-maker’s racing heritage in mind, I really got the feel of the road. This was of course compounded by the terrible local streets in Minneapolis and especially St. Paul, as well as the worn out suspension on the vehicle itself. You can measure this yourself with your smart phone. Transfers and Signage: How are people supposed to do transfers if they have never done transfers before if bus route information is not on the bus stops? The 84 was a hi-frequency route, so I could figure it out, as there was some additional signage, but the Metro Transit trip planner is not obvious about this, and other transit apps are equally bad. The reverse trip would not have been obvious. Getting real-time information on my smartphone is hit or miss, and not everyone has a smartphone. There need to be better bus top signs. The Metro Transit trip planner website which was consulted before I left in the morning said I should take the 67 on my return trip, and the bus stop indicated it stopped there (this was the bus stop nearest Raymond Avenue station, so it has recently been upgraded with a slightly more informative sign) but I didn’t know when it would arrive (sorry OMG transit did not tell me either, it must have been below the end of the screen, and getting OMG transit to update GPS seems problematic. Frankly, it’s still beta.) and a 16 bus showed up, which I was familiar with and took it to the nearest stop and had a 8 minute walk instead of 2 minutes. Figuring out transit information can take as long as the ride itself. 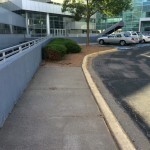 Sidewalks: There were sidewalks on County Road B-2, but within the office complex itself, I was apparently expected to walk in the driveway. There should either be a formalized shared space (unlikely as this is a suburban office parking lot) or actual sidewalks along the driveways. 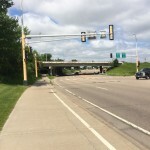 Better, there would be diagonal sidewalks so that people can walk directly from Water’s Edge to Rosedale, both from the Water’s Edge building to County Road B2 just under Snelling, and from the other side of the underpass from County Road B2 to Rosedale. One imagines MnDOT employees drive out to lunch the less than 1/2 mile to Rosedale. Roseville has a program called “Living Smarter“, there is some work to do. While it might be impossible to make this city-like in its pedestrian orientation, it certainly can be better than it is. Circuity: The 87 bus exiting Rosedale seemed to take a very circuitous route within the shopping mall. It is literally a spiral (see figure). I am sure there is an internal traffic flow reason the shopping mall wants buses tearing up its pavement, but I couldn’t figure it out. There was a curb preventing the bus from crossing at other points, but surely there should be some way of allowing buses to get out quicker. This would save about a minute by my timing. The bus then went along B-2 and Fairview, and there were at least 3 stops before we left sight of the shopping mall. Still 30 minutes end-to-end (excluding schedule delay, but including transfer time and walk time) from Rosedale Transit Station to home is tolerable, longer than driving of course, but not onerous or painful, on a nice summer day.